Canadian scientists have identified microscopic creatures that are so unlike anything seen before, they had to create an entirely new branch on the evolutionary tree of life to slot them in. A new paper published last week in Nature offers the first genetic analysis of hemimastigotes—a rare and poorly understood group of single-celled microorganisms. Biologists have known about these wee beasties for well over a century, but only now can hemimastigotes be officially slotted into the evolutionary tree of life, a process more formally known as phylogeny. And by doing so, scientists have stumbled upon a completely new branch on the tree of life—one dating back billions of years. Yana Eglit, a doctoral student at Dalhousie University and a co-author of the new study, found two different species of hemimastigotes—one already known and one completely new to science—in soil samples collected along the Bluff Wilderness Trail in Nova Scotia, Canada. The previously known species is called Spironema and the new one was dubbed Hemimastix kukwesjijk (pronounced “ku–ga–wes–jij–k”), which means “rapacious hairy ogre” in the language of the Mi’kmaq First Nations people of Nova Scotia. Rapacious and hairy, indeed. These single-celled, free-roaming predators feature two rows of hair-like flagella, which they use for locomotion and grasping onto prey. Hemimastix feeds by connecting its mouth—if it can be called that—to the surface of its equally microscopic prey, sucking up the victim’s cytoplasm, according to observations made by Eglit and her colleagues. Hemimastigotes cannot be classified as animal, plant, fungus, or bacteria. But they’re eukaryotes, having complex cells and a clearly defined nucleus. Eukaryotes that can’t be slotted into these conventional groupings are called protists—a kind of grab-bag grouping of sometimes unclassifiable eukaryotes. Such as hemimastigotes. Aside from describing them as eukaryotic protists, scientists haven’t been able to place them anywhere within the phylogenetic tree of life. Part of the problem was that scientists weren’t able to perform meaningful genetic tests on hemimastigotes—but this has now changed, thanks to the new research. Using a new technique called single-cell transcriptonomics, and with the help of PhD candidate Gordon Lax, the Dalhousie team was able to tease large amounts of genetic material from the two species of hemimastigotes. The entire genomes could not be extracted, but enough information was gleaned for the researchers to perform a phylogenetic analysis. Virtually all eukaryotes belong to either the animal, plant, or fungi kingdoms, but some eukaryotes cannot be classified as such, and are deemed protists. Not satisfied with these broad designations, scientists created six “super-groups” for the eukaryote domain: Sar/Telonemia, Haptophyta/Centrohelida, Archaeplastida/Picozoa (this group contains plants), Cryptista (this group contains algae), Discoba, and Amorphea (this group contains animals and fungi). To group these kingdom-level eukaryotes even further, scientists created one “supra-group,” called Diaphoretickes, that lumped four similar super-groups together (see diagram below). The purpose of this organisational scheme is to sort and cluster species according to their relation to common ancestors, rather than by their physical characteristics or other attributes. The six previously established eukaryote super-groups and Diaphoretickes supra-group, plus the new hemimastigotes supra-group proposed in the new study. Animals and fungi are in the Amorphea super-group, while plants fall under Archaeplastida + Picozoa. Previously, scientists had designated Hemimastigophora at the level of phylum (below kingdom), but the new study suggests they belong to a distinct supra-group, or a “novel supra-kingdom-level lineage of eukaryotes,” in the words of the researchers. In addition to being the first to perform a genetic analysis of hemimastigotes, the Dalhousie team is also the first to culture these organisms. Armed with a steady supply of hemimastigotes to experiment upon, the researchers are now hoping to glean more genetic information from these remarkable creatures. Andreas Hejnol, group leader of the Sars International Centre for Marine Molecular Biology at the University of Bergen, said the paper is valuable in that it provides a phylogenetic analysis that finally places these organisms in the tree of life. Praise aside, Hejnol said it’s important to remember that categories such as “supra-kingdom” and “super-group” are simply “anthropogenic categories” that scientists use to classify and organise organisms—meaning, they’re a human construct subject to change as our understanding of biology changes. 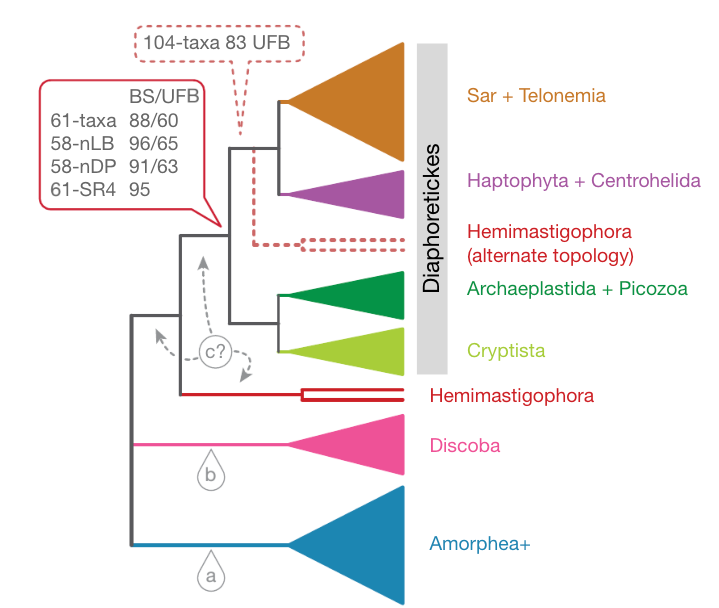 In the case of the new study, the phylogenetic analysis placed hemimastigotes on a major new branch—one that now sits alongside a pre-existing sister branch of eukaryotes known as Diaphoretickes.